Today exhausted me. A Thursday 5 p.m. deadline inexplicably became a Wednesday 2 p.m., and somehow, on what is supposed to be the deadest (inventive language like this is what I get paid the big bucks, folks) news week of the year, I was under an avalanche of it. Plus, there were other insults to injury: I had my first warm latte of the cooler season and spilled a good sum of it on my pink shirt, I stepped in a puddle and my surprisingly absorbent sandals remained damp and cold all day and I realized that flame-tinted leaf I’d seen this weekend and considered sort of a fluke, might not have been. Don’t get me wrong — I love fall — just not in August. Reminding myself that complaining about the weather makes for about as interesting conversation as “wow, I thought it was 4:15 but it’s only 3:45,” I decided to roll with it, as well as with The Coolest Anniversary Present Ever from my husband: an eggplant-colored, 7.25 quart oval Cocotte and a soup I’ve had bookmarked since last winter. Let’s just cut to the chase already: the soup has 44 cloves of garlic in it. 28 are roasted and then peeled, 18 peeled and then simmered, and somehow the outcome is subtle, but not boring. My 11-clove serving was heavenly, and with a glass of wine we fell back into that haze of garlic Ruth Reichl so aptly describes in Comfort Me With Apples after feasting on duck with garlic mosaics, fish wrapped in puffs of garlic pastry, lamb surrounded by garlic puree, arugula salad with garlic-rubbed croutons and poached figs in red wine with garlic meringues at Chez Panisse. “If everyone ate more garlic, the world would be a happier place,” she says, and if this soup is any indication, I wholeheartedly agree. Preheat oven to 350°F. Place 26 garlic cloves in small glass baking dish. Add 2 tablespoons olive oil and sprinkle with salt and pepper; toss to coat. Cover baking dish tightly with foil and bake until garlic is golden brown and tender, about 45 minutes. Cool. Squeeze garlic between fingertips to release cloves. Transfer cloves to small bowl. Melt butter in heavy large saucepan over medium-high heat. Add onions and thyme and cook until onions are translucent, about 6 minutes. Add roasted garlic and 18 raw garlic cloves and cook 3 minutes. Add chicken stock; cover and simmer until garlic is very tender, about 20 minutes. Working in batches, puree soup in blender until smooth. Return soup to saucepan; add cream and bring to simmer. Season with salt and pepper. Divide grated cheese among 4 bowls and ladle soup over. Squeeze juice of 1 lemon wedge into each bowl and serve. Do ahead: Can be prepared 1 day ahead. Cover and refrigerate. Rewarm over medium heat, stirring occasionally. Okay, that’s it. Next time we’re in New York, we’re eating at your place. All kidding aside, I would love to see fall in August. Today was the first day since, oh I don’t know, MAY that it hasn’t been 100+ degrees. I’ll hold on to this lovely recipe until November or so. Just thought I’d let you know I’ll be spotlighting your blog tomorrow for Blog Day 2006. Hopefully quite a few of my readers will come and visit you. I found your site via your comment on The Wednesday Chef. This soup sounds perfect for a rainy fall day and your photograhy and writing is wonderful. So glad Kalyn found you. Your blogs looks fab. and I have to try this soup but like Jennifer, It’s got to be under 100Ã‚Â°. November would look good. I love your site and will be back often. Thanks to Kalyn for recommending you. We have had a warm summer for Denver but it’s been cooler this week so maybe before long I can make the soup. 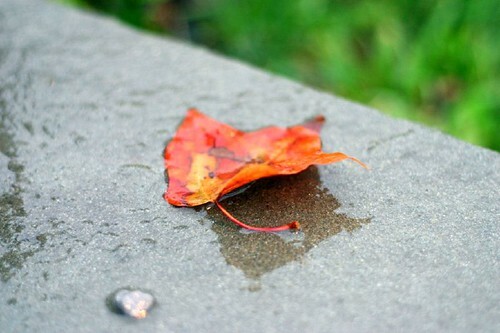 Jennifer – I’m probably jumping the gun *a little* with this declaration of fall. When it actually arrives, I will mock my current sandal-and-t-shirt-wearing self for thinking that 71 and damp was cold. That said, I hope you get to make the soup soon, just not too soon! Kalyn, Julie, Tanna and Judy – Welcome and thank you! Deb – I know just how you feel. And by the way, that cocotte looks drop dead gorgeous. If a piece of kitchen equipment could be called glamorous, that would be it. Hope to see more of it! I just discovered your site through Kalyn – I love the presentation. I have dropped you in my rss reader and cant wait to read more and see more of those beautiful pictures. I just discovered your blog (thanks to Sweetnicks) and love it! I’ve added you to my list of links. Happy blogging! Hey Deb, I can help you install the live comment preview plugin. I have it on both of my blogs. Just found you (thanks, Sweetnicks!). Love your blog! I, too, discovered your blog via your comment on Wednesday Chef; the “Foodie Jeopardy” line really made me laugh. Great writing and photos, and that cocotte is a beauty! Deb, I followed you from ivillage. I too am a newlywed and a little obsessed with food, and reading about food, and talking about food (and perusing recipes online, and thinking about food shopping) . However, I have a 5 month old, and his level of patience does not allow me to spend the time in the kitchen as I would like to. So I will continue to visit your site often. PS– its a little pedestrian, but I feel about my crockpot the way you feel about your Cocotte! oh, the leaf is lovely! it made me happy from just looking at it. Can I use it as my desktop wallpaper? Oh my. I’ve never made soup before, but I came across this recipe today and had to try it. I always thought I didn’t really like soup, but turns out I just never had anything so absolutely fantastic. It was fairly simple to make, and nothing short of delicious. I plan on using the leftovers as a sauce on some type of fish tomorrow, if I have the willpower not to eat it before then. This was a total Thanksgiving hit. Despite the fact that it was a little futsy, I would make it again. Using an immersion blender made life lots easier. wow what an awesome way to OD on garlic! great blog and great soup! we made it last Tuesday and OH how yummy it was!! A friend and I made this for a family dinner a couple weeks ago and it was a huge hit at our gathering! This is a delicious dish that everyone should definitely try. It would be especially wonderful on a chilly Fall day. This soup is exquisite. I’ve had the recipe saved in my bookmarks for a month or more but the temperature only recently dropped below 90, so I made it for the first time tonight. I can’t believe how subtle and rich this is. It’s amazing. YUM – reduced the broth to make the soup super thick. Again, YUM! This was FABULOUS. We loved it!!! Any vegetable stock would work, whatever you would like with garlic. Actually, we made this for the two of us as we were watching the Super Bowl (I know, it’s not very Super Bowl-y, but we were out of beans). We used Imagine low-sodium vegetarian broth. In this particular recipe, I think low sodium broth is essential because I didn’t add any salt and it was perfect. With a regular broth, I think it would have been too salty. Oh and it was yummy! First, I envy your cocotte. Second, the soup was incredible. It was smooth and rich. In fact, I’m jonesing for some right now. Lastly, I appreciate how well you write. I made this last night for my husband and myself and used vegetable broth and half and half instead of chicken broth and whipping cream. It came out wonderfully, and there was enough left over for us to have it for lunch sometime during the work week! Wow. I am convinced that the cafe I once went to in search of this soup in a little town on the central coast of California actually stole this recipe. I am completely sure. Thank you for posting this so I can recreate it. I was shocked how much the lemon did for it, shocked. That, and my heavy hand with the salt. This is such a healthy recipe. Did you know that garlic is one of the best foods to use to help the body ward off bacteria, virus and helps boost the immune system. I think I will put this recipe in with my herbal remedy stuff. I had to combine two of your recipes into one. http://pseudicide.livejournal.com/917455.html I just couldn’t decide which to make! I made this tonight and I kept making little yummy noises the whole time I ate it. Cold begone! I made this soup last night only by recommendation of a friend. I normally would never pause on something like this and I am very pleasantly surprised and loving this soup! I omitted the cheese but the lemon is a must. Thank you for the recipe and though this is my first time visiting this website, it will certainly not be my last. I enjoy the simple layout, directions, and beautiful pictures. I made this last night as well; I’ve been pining over it since I’ve seen it – garlic was on sale for 25 cents each and I had to try this finally. And boy, was I ever glad…this one’s a keeper! Thanks! I made this last night and can’t wait to serve it tonight. I’m always amazed at how sweet and mellow garlic becomes when cooked for long periods of time. (Perhaps someone should cook ME for long periods of time?) Thanks, Susan, for the comment about the lemon juice. I might have skipped that step, but will be sure not to now. I LOVE your blog, everything about it!! I discovered it recently when I was googling for an apple cake recipe. I love the cake…we love it….already baked it twice. Now, the soup…. simply love it! !… and your bundle of joy is sooooooo CUTE and ADORABLE!! Thank you for the recipes! This soup is so good! I made it yesterday while also making your mini soft pretzels (yum!). I don’t have a blender so I decided to puree the ingredients in my food processor before adding the chicken broth. I ended up with a few small garlicky bits, but overall, the soup was still very smooth. Just thought I’d share in case anyone else had a similar equipment problem! Two thoughts. 1) This recipe’s name needs to be officially changed from 44 clove garlic soup, to 52 clove garlic soup. 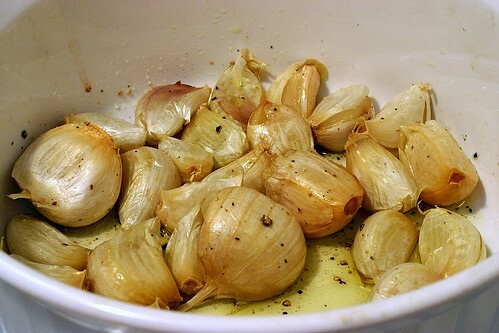 Two roasted garlic cloves should be used as a garnish on each bowl. 2) Swine flu, be damned! Talk about a great soup to make right as early cold/flu symptoms arise. Made this soup last night for thanksgiving, LOVE IT! Lord lord lord, i just made this for dinner for me and a friend and it was honestly the most delicious thing i have made in a long time. So easy and so very tasty, it came out even better than i had hoped, even though i substituted mixed dried herbs for thyme and cheddar for Parmesan. Thank you so much for this recipe! Just made this for dinner, and we had it with crusty sourdough bread, salad greens, and a good bottle of wine. AMAZING! I just made this soup and it was delicious! I also added in potatoes and white beans. So tasty! A perfect soup for this horrible weather we have been having. Wow. This was exactly as described, subtle but not boring. I was surprised that the soup wasn’t MORE garlicky! Overall an excellent meal! Can I suggest a pairing with a grilled gouda sandwich on sourdough? mmmmmmm this is my faaavorite… i’m a garlic addict. i made this for myself and my mother once… i used a few extra cloves of garlic, of course… and once it was ready, mmm boy! we ate 25 cloves of garlic each, at once. we couldn’t stop. if there had been more, we would have eaten as much more as there was. since then, every time i mention it, she says “not if we’re going to have to go out in public the next day!” because as it turns out, eating 25 cloves of garlic for dinner has some.. interesting (ready: gassy) effects on the body. …but damn is it worth it. today, i woke up feeling a lot more like death than a few beers last night can explain, knew i was sick, and started formulating a plan: tea, tea, garlic, more tea, kombucha, GARLIC SOUP. (and cake, i must have cake.) sometimes i think getting sick is just an excuse to eat garlic soup. i’ve got the house to myself tonight and i intend to have a moderate bowl of the soup along with some bread and salad, and serve up the rest of the soup tomorrow among three people. but the more i think about it, the more i doubt that there will be any trace of garlic soup by tomorrow. except a lingering odor, of course. Garlic lovers – try Caprial Pense’s Fresh Tomato Tart with Roasted Garlic Crust! The crust another winner! we made this for the second time. it’s so simple, so easy, so soothing! thanks. Hi deb- made this soup this weekend. I loved the taste but it didnt come out as thick as i’d hope…any suggestions? Also, I was wondering if I could substitute sour cream for the heavy cream? Thanks! I’m thinking of making this.. can I freeze it, though? I was thinking of freezing it after the stock is blended and before the cream is added. I usually cook just for myself and don’t want to have to throw a lot away. Rachel — Of course. I see no reason why not. Thank you, thank you for the recipe! I decided to just make the whole portion and not freeze any of it (giving my mom a portion to take to work tomorrow), and just tasting it for seasoning even before the lemon and parmesan, it’s already perfect. The garlic is very pronounced but still delicate and I love the consistency and mouthfeel – it’s rich tasting and yet light. Perfect summer soup! Perfect all year soup! Looks really yummy, I’ll make over the weekend. I love your blog, I’m so happy i found it, I’m a web designer with a interest in food photography. Great recipes, thanks! wow, i’m usually a blog lurker not commenter but this soup inspired me right out of that habit. ridiculously tasty, simple and cheap, thanks so much for posting!!!! one question though – do you have any recommendations for vegetable or other food that can be added to make the soup a little more of a meal? thanks again! this was the most delicious thing i’ve ever made. well, not the most delicious thing, but it is quite heavenly. and very cheap. i’m struggling to not eat all of it myself right now! oh my goodness, my friend recommended this to me the other day, and I was slightly skeptical just because “44 cloves of garlic? hmmm…” and I’m not a huge fan of thyme, but this. was. amazing. WOW!! Thank you so much for sharing! WOW. I just made this and I am reeling from how good it is. I mean wow. This is a great recipe, but on a hot summer day I wanted to keep the cooking down to a minimum on my gas stove/oven so I roasted the garlic in the microwave, and cooked the onions and the garlic with the stock in a crockpot. 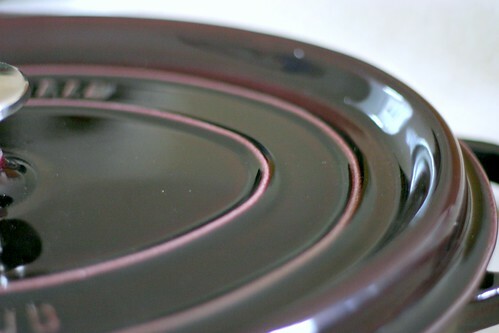 I roasted the garlic in a microwave safe corning ware glass bowl with a glass lid (I NEVER cook in plastic containers, no matter how safe the product claims to be). I sliced the tops of the garlic cloves off, and drizzled olive oil over the top. I placed it in the microwave, covered with cut side up microwaved for 60 seconds. Turned garlic bulb over and microwaved one minute more and it was perfect. Cooked onions and garlic as directed and added to crock pot, turned on high. Soup finished off in about 4 hours on high, and came out wonderful. After pureeing back in the pot, add cream and heat it back up and it’s ready. Really yummy! Next time I will try adding more roasted garlic, and possibly more fresh. This soup was AMAZING!!!! I used parsley instead of thyme because that’s what I had, but it was soooo good! Thanks for the recipe! I also made your maple nutmeg pie (minus the nutmeg haha) and that was amazing as well! This was so delicious! I love lemon so instead of juice, I used chopped lemon flesh so there were occasional bursts of pure lemon flavor. I can totally see this as being part of a more substantial soup with vegetables or maybe even as a meatless alternative to chicken noodle. made this yesterday for lunch and my husband and I absolutely LOVED it! A wonderful garlic flavor with just a hint of lemon – Mmmm! I know I’m behind the game here, but I just found this recipe and am super excited to make it! I have a question, though: is there any non-dairy substitute I could use in place of the cream? I have a lactose-intolerant fiance who loves garlic. He can tolerate sour cream (or even plain Greek-style yogurt) to a point, so I thought either of those might work, but I wanted to see if you had any brilliant suggestions! I made this wonderful soup last year (loved it) and am contemplating making it again. However, everything, and I mean everything in my tiny apartment ended up smelling of garlic for weeks. From my jackets, my purses, clothes in my closet, the pillow on bed, everything! Any thoughts…any one else experience this strange phenomenon? Just curious? Love your blog and have loved everything I have made! Made this soup two nights ago, and it was fabulous! I found that it was actually even better reheated the next night, for whatever reason. I used coarsely grated Parmesan cheese, which gave some good texture to the soup. Definitely don’t skip the lemon– it added SUCH a great flavor! Great recipe! And I love telling people what i’m making. I added parsnips to mine. I mistakenly bought 6 large garlic when I read your ingredients for the garlic butter mushroom (my brain somehow forgot to read the word “cloves” after “3 large”). Was pondering on what to do with the remaining quantity… when I stumbled onto this gem. Voila… I’m SO set! Thanks! Loving your site, the beautiful pictures and the awesome recipes! My friend is sick, so I made some today and brought a bowl over (my car now reeks of garlic). It was great, better than I could have ever imagined, and I was honestly surprised when I tasted it- I made this? I could have done without the awfulness of squeezing hot garlic out of the casings, but it was totally worth it. Great recipe. This + whole-grain artisan bread + a salad = one very happy chef. (I think the rest of the family liked it, too, but to be honest I hardly care.) Brilliant. I came over here to figure out what ingredients I need for my third time making this soup and realized that I never commented to tell you how much I’ve enjoyed it. It’s definitely a new favorite for me – I added some homemade croutons and it made a lovely meal. Thank you! Delicious delicious stuff. I am thinking about making a much bigger version of this recipe – enough for 15 or so people. Is there a limit on how much I should be quadrupling some of these ingredients? 176 cloves of garlic could be a lot? Oh. My. Goodness! Shazzzzam!!! I love garlic. I paired this with really excellent local sourdough and a new burgundy. I had to be restrained by my S.O. Not to eat the WHOLE pot. It almost came to blows. Thank you for my new addiction! I’ve been on a smitten cooking rampage lately (shakshukan, pita bread, St. Louis gooey butter cake). All winners in my kitchen with the help of your instructions, beautiful pictures, and slapstick. Oh, and the absolute adroable pinchableness that is your resident mischief maker. Can’t wait to try more! I just made this! A hot bowl is sitting right next to me as I type this. Though I had a HUGE brain fart in the grocery store and picked up fresh basil instead of fresh thyme. I used the basil anyway and threw in some dried thyme. Still amazing!! I just wish I had some toast to go with it. Wait, I do have crackers! I’ve just stumbled across your blog (and happily made your oatmeal raisin cookies –yum!) and this looks amazing. Why have I never thought of Garlic soup? Garlic is my favourite of favourites! I’ll be trying this one soon! A little tip for Allie — if you crush the garlic clove with a large knife (or anything flat) first, it will usually fall right out of it’s peel. Someone linked one of your posts on facebook, and after wandering through your site I found this recipe (and the French Onion soup one). I was going to make the French Onion, but then my husband declared he didn’t like French Onion, so I made this earlier in the week than planned. It is AMAZING. I didn’t use thyme (didn’t have any), used milk instead of cream (it’s what was in the fridge) and didn’t use the lemon juice ( I forgot, but will definitely remember for next time as the comments above state it makes a fantastic difference). Thank you, this is just delicious. I tried your Zuchinni bread last night, and brought to work today, they all love it, and ask for the recipe. Thank you so much for all you have shared. Such a great recipe, I loved it! Wow. Yum! Amazing and easy. Fall arrived this weekend, and your soup arrived just in time! I just made this soup tonight and Deb, it was AMAZING. Seriously. It’s my new favorite onion-ish soup. The garlic was subtle and so so flavorful. This is one of my all-time favorites of your recipes. THANK YOU! That is all. This is exactly what I needed on this beautiful fall day. My wife just made this recipe yesterday. It was absolutely fantastic. I have been searching for a garlic soup that is able to warm myself in the dead of winter and am ecstatic to try this recipe. I am about 20 cloves short but will be at the market in the morning to make this! Thank you times a million and I’d have to agree that if we ate more garlic we would be living happily ever after. Yummm! Just made this last night — the first creation to come out of my new santa-bestowed food processor. I’m so grateful to add another item into the “Effortlessly Fancy” category in my culinary portfolio. Thanks, Deb! How to peel garlic… fast! I find it easier to roast whole entire garlic bulbs. Drizzle them with a little olive oil, wrap them with foil and 45 minutes they are all nice and toasty. Then you can easily squeeze the roasted garlic paste out all at once instead of having to do the cloves individually. I made this soup today along with smashed chickpea salad sandwich for lunch. Heavenly. Dont wait till the weather gets cold to make this one. My husband is JUST putting this on the table…can’t wait to enjoy! Another SK recipe success for me! I have to admit I was a little scared about the thought of garlic soup, but I am glad I tried. I agree with many others that the addition of the lemon really brings the soup over the edge into amaaaaazing. Leah, I make this soup often and I typically put in 1 medium or large onion. I love love love this soup. I use this soup to cure colds. And when served with a crusty bread to dip into the soup and the leftover olive oil from roasting the garlic, it makes a perfect and elegant meal! I’ll need to remember to make it ahead of time and freeze it so I dont have to stand up and make it when I am actually sick! About the conversion between cups and g, I would recommend to just buy a cheap set of US Measuring Cups online through Amazon.co.uk (while you’re at it you might want to buy a set of tablespoon/teaspoons too). I am seeing some sets right now for as low as 3£ on amazon for the spoons and the cups all together. It won’t only help with this recipe but every recipe you find with US measured ingredients. how is this adapted from bon appetit? i don’t know…am i missing something? this is the exact recipe as bon appetit only the name of it is “44 clove” instead of “roasted garlic soup.” this happens a lot here but i guess it doesn’t bother most of your readers. Hi Nina — Credit is given to the original recipe, right under the title. I use garlic to cook almost everything, so had to try this out. I was pleased with the earthy taste of this soup. The lemon juice was a perfect complement. Thank you! Made this soup the other night and it was a m a z i n g. Followed the recipe to a t and it came out beautiful. My husband called this the best soup ever. It tasted rich without the added fat and calories that are often found in creamy soups. Also, pureed garlic and onion give the creamy texture. I’d make this again for years to come! My husband brought home a 1 1/2 pound bag of garlic. Not sure what to do with THAT much garlic. Came across this recipe and OMG! INCREDIBLE…it was lick the bowl kinda good! Made this again tonight, with the addition of crispy prosciutto (Martha Strewart recipe). Didn’t think it was possible, but it kicked this already amazing soup up a notch! Making this right now, smells amazing and the perfect recipe for my 2lb bag of garlic! Made this tonight – sensational! I added some parmesan and parsley croutons as garnish and it was incredible. The hit of lemon really makes it. Hey Deb, how do you find this recipe with garlic breath? I haaaaaaate the after effects of eating garlic, but really really want to make this soup =) thanks! I made this yesterday and it was very good. I replaced thyme with chives as I can’t stand thyme, and I think it fit right in. One thing I would do next time is to replace the cream with milk, as the pureed garlic already makes the soup creamy and the cream made things a little heavy for my taste. I turned the leftovers into a pasta sauce, thickening it a little bit and then adding spinach, charred grape tomatoes, basil and pine nuts. It was so, so delicious! Hi Deb, any suggestions for making larger batches of this soup? I tried it yesterday and it was absolutely perfect so I’m considering making this for Thanksgiving. I’m thinking that a triple batch might be necessary though… would you recommend changing anything? Love your posts and can’t wait for the new cookbook! Thanks for another fabulous recipe… We added a can of white beans with the chicken stock and skipped the cream- just lovely. I thought this recipe was an excellent base. What I needed though was to feed 5 adults after a hard days work. So I added five cubed potatoes, an extra amount of garlic (say a whole bunch about 20 extra roasted then an extra 10 into the stock) I added extra stock (twice the amount called for), cooked thoroughly until very tender, then blended. I then added cream cheese the whole rectangular block…oh so very Knotty but scrumptious. We served this delicate excellent wintery dish with warmed, buttery, herb bread and paid homage to next years garlic. Dear God. First I made the cheese straws… Then the cream biscuits… And now… This incredible soup. If I had to survive with only 2 things on an island… I think it would be books and garlic. This soup blew my mind. I am vegetarian, so I used veg stock instead of chicken. I made a fresh loaf of bread with it and sweet Mary mother of baby Jesus was this my favorite soup EVER! Perhaps I’m just greedy; I halved the recipe but still ate 2/3rds! I will be making this all winter!!!! Thank you!!!!! <3! What would you think of adding a can of chickpeas into the soup to add some protein? Do you have any suggestions about how to handle this or whether it would taste good? Thanks! Hi Naomi — I haven’t done it but don’t see why you couldn’t just add them at the end as they are already cooked and need only to rewarm. Add them sooner if you’d like them to absorb more of a garlic flavor. this soup was DELICIOUS and tasted like it was from a gourmet restaurant! THANK YOU!!!!! Holy crap. This soup was sublime. I will be trying more recipes from this blog. Oh my gosh – this sounds wonderful! I LOVE garlic – I put double of it in every recipe and recipes that don’t even call for it..lol. Found your blog on Pinterest – going to pass it around and definitely try it myself! This was fantastic!! Thank you Deb!!! Today, stuck at home with the flu, I found this recipe. I made a vegan version with oil instead of butter, oat cream, vegetable stock and no cheese and it’s still awesome! Thanks for this! I feel better already! Anna — Yes, that would be just fine. My friend and I are planning on making this on Friday and I think this is the first time I’ve ever had to say, “I hope I have enough garlic!” We plan on enjoying it immensely. Was looking for a good garlic soup when I came across this recipe. It sounds and looks devine. I even read through every posted review. I must say I was skeptical about using thyme and lemon. But the more I read the more it changed my mind. I truly look forward to making this soup. My first taste of it was on a Royal Caribbean ship…I thought it was heavenly. These people make it sound like it’s going to be the same recipe. I can’t wait! Thanks for blogging! Y’all, this soup is lick-the-bowl good. I’ve been eyeing this recipe since I started reading the blog about 5 years ago, and I finally made it because a friend was coming down with a cold. N.B. : If you care about having a smooth, even texture, definitely use a regular blender. There were quite a few cloves of garlic that escaped the fearsome wrath of my stick blender. I didn’t care, but you might. This recipe was divine. Even my boyfriend, who is slightly garlic-phobic, tasted my soup and immediately poured himself a large bowl. Thank you! We didn’t have chicken stock, so we substituted beef stock. It’s delicious. probably my fav soup EVER!!! i make it up on vege stock but it is still divine. anyone out there had any success making a vegan version of it (i failed miserably when i tried)? For the cream I used cashew cream which worked really well. For cashew cream, I blended 1/2 cup of soaked raw cashews with 1/3 cup of water. This makes more “cream” than the recipe calls for, but I used it all and thought it was delicious. Thank you so much for sharing this fabulous recipe. It was so comforting and delicious. I was afraid that my substitutions would make it taste weird, but it really turned out well. I think cashew cream is a better substitution than soy creamer or coconut milk because its pretty flavorless (make sure you use RAW cashews). I hope this soup will help my body kill whatever icky sickness I have! A sudden favorite on Christmas Eve, thanks! We followed the recipe exactly and the soup was absolutely delicious! This is one of our new favorites! Just wanted to let you know, we used this recipe for our wedding in the summer. It was a huge huge hit. My bridesmaid brought garlic directly from her farm in Ontario (we live in Saskatchewan) and we did it directly from farm to table. The crowd went wild! We also misjudged how much to make (since we had other dishes as well), and we had tonnes of leftovers, which carried us through the summer. Thanks for a terrific recipe that also made a great wedding memory! Yum…just made this because I’ve been hankering for something garlicky lately. Doubled the recipe because, hey, if I’m making it, it’s just as easy to make double. It’s delicious! TIP FOR PEELING RAW GARLIC CLOVES: put the individual cloves with the skins still on in a metal bowl, cover with an upturned second metal bowl (I used a metal pot with a metal lid). Then, shake the heck out of the whole thing. The cloves bounce around inside and peel themselves. It’s a brilliant trick I saw on YouTube recently, and SO much easier than peeling them individually! I made this for a work function…doubled the recipe, so it was 88 clove garlic soup. It was a huge hit!! No leftovers though! :( Thanks for the recipe. I really liked the addition of the cheese and lemon. We also added garlic croutons, which aren’t necessary, but added a nice crunch. Another SmittenKitchen success. I made this using fresh garlic from the farmer’s market and nervously substituted rosemary for thyme. It turned out delicious. The flavors are rich but the soup is still very light. Thanks! I have made his soup a bunch of times and it is amazing!! I was feeling a bit lazy one time and thought heck, why don’t I just roast a couple of heads of garlic whole and that way I won’t have to peel all those tiny hot single cloves of garlic…I can never wait for them to cool! When I used the whole heads of garlic versus the single clove method the soup just wasn’t as flavorful! So I am back to separate cloves….ps make sure both you and you sweetie eat this soup no just one of you!!! Good lord this was delicious!! I found this recipe over the weekend and at first I was a little scared, a soup basically made from garlic and onions? Crazy. But then the idea didn’t leave my brain so I decided to make it last night just to see what all the fuss was about. WOW!!!! SO GOOD!! Even my husband loved it and that surprised me since it was so brothy and he usually likes his soups to be more solid with substance. We finished the whole pot off wishing for more! Then we actually FELT our bodies get healthier, gotta love that garlic :) Thanks for the wonderful recipe, I will be making this again and again! This was absolute heaven in a bowl. Served with some warm French bread with melted butter, and this goes down like being wrapped in a warm scarf on cold night. Amazing. Thank you for sharing what’s been years ago now! Whoa. Is all I can say about this. My kitchen smells heavenly and this gem turned a rough day into something really awesome. I’m not sure if this is entirely in the recipe but at the end I ladled some of the soup into the glass bowl I roasted the garlic in and then poured it back into the saucepan with all the olive oil and flavor….and before that while I waited for the soup to cook, I mopped up a litle of that awesome oil with some bread. Incredible. Winner winner…44 clove garlic dinner! SO GOOD!!! And my Kitchen smells AMAZING!!! I used 1% milk for a lower fat alternative and its unbelievable. My fiancé bought a giant bag of peeled garlic–I was trying to figure out what to do with it when I stumped across this article. For the roasted cloves, I just wrapped them all in foil with the oil, salt and paper and the roasted just like garlic does unpeeled…and less prep time! SO GOOD!!! And my Kitchen smells AMAZING!!! 1. I used 1% milk for a lower fat alternative and its unbelievable. 2. My fiancé bought a giant bag of peeled garlic–I was trying to figure out what to do with it when I stumped across this article. For the roasted cloves, I just wrapped them all in foil with the oil, salt and paper and the roasted just like garlic does unpeeled…and less prep time! This soup is always a hit!! I use beer/whiskey/wine to deglaze the pan after cooking the onions and it gives it a bit of a deeper flavor. Note of caution though: don’t do anything for about 12 hours afterwards :) you will reek of garlic, in the most amazing way ever! AMAZING….my biggest problem which was not really a problem was i could not stop eating the roasted…lol i used vegie broth and omited the cream only cuz i did not have any…. still was awesome. also really good for my cold. …THANK YOU. This soup just totally cleared out my sinuses and I feel great. It should be listed as a cold cure. On top of that is was delicious. Instead of adding the parmesan to the soup, I toasted bread with parmesan, paprika and butter on top which ai served on the side. I just discovered this recipe 2 weeks ago and we have already made this soup 3 times since then and I am still dreaming about it and missing it every day after we slurp up the last drop. We doubled the recipe last time and this time we are going to quadruple it so we get to peel 176 cloves of garlic, sounds like a good time. :) Worth every second. Maybe it will last longer than 2 days this time with a bigger batch….but I doubt it. How is this “adapted?” So many times I see these recipes that are virtually identical to the original published recipe. If there are differences, they are minuscule. Karen — Now fixed, thanks. Hi Deb! Is there any reason (flavor difference/chemical changes) for roasting the garlic in the peels? Amber — Yes, I find it gets sweeter and softer because the peels keep the moisture in tightly. We think this is it!!!! We had a wonderful garlic soup in Garmisch a few years ago. I’ll be making this one soon! So, Im sick, and I found this. I figure if 44 cloves wont kill it nothing will! I made mind into chicken noodle soup though! As the broth simmered i added bone in chicken, then all the garlic as indicated. Before blending I pulled he chicken out and shredded it then added it back to the blended soup with chopped carrots. I seperatly cooked Klusky dumpling style noodles in broth and added them at the end. The result was THE best ever chicken noodle soup!! Thanks!! This was delicious! I think this will be my go-to ‘I don’t feel good’ soup. I was feeling incredibly lazy and used my slow cooker instead of the stove top.. turned out AMAZING. Thanks!!! I’m late to the party here but to anyone reading this – make this soup! It is extraordinary. I use my immersion blender. I served this to company with a crusty bread (sliced, brushed with olive oil, salt, pepper, and thyme and a sprinkle of parmesan and toasted in the oven for a few minutes) and a big salad and everyoe was very impressed. So good! I made this yesterday because I’m coming down with a terrible cold (I know it’s terrible because all the students are miserable). It’s amaaaazing. I’ve been adding cayenne to it as I reheat bowls (my taste buds don’t pick up lemon right now), which is also delicious. For the folks who like things to be vegan, I didn’t add the cream or cheese at all, and the soup is just fantastic without it. Great recipe – wonderful flavors! I took the liberty of adding cannellini beans, giving a little more body. Served with crusty bread – fabulous meal. Anon — Thanks for the heads-up. This was delicious! I’m planning on making it again, soon. I think next time I might double or triple the recipe and freeze some just before adding the heavy cream. This would be a nice soup to have on hand when I need a quick dinner. Just made this soup, smells amazing! One question, can I add the cheese and lemon if I’m not serving until later? Thank you! i made this friday night – i’m not sure why i saw this and suddenly had to make it, but i did. the only thing i changed was to use my immersion blender to blend the soup. it came together so easily and was really good – not overwhelmingly “garlic-y” at all. great for dipping bread! if i were to eat it on its own i’d want it to be thicker somehow, more like a potato soup. but we had it as a side to a steak tip and tomato dinner and it was great. Made this exactly as stated in the recipe. LOVED the flavor from the roasted garlic, but I just felt this soup had WAY too many onions in it. Also, when I put the cheese (measured by weight) in each bowl, it was a LOT of cheese. It was definitely good, but not perfect for me. However, it gives me a good base as I continue my search for the perfect garlic soup…. To say I made this is an understatement. I’ve been making this for ten years!? Oh how time flies. Made it again last night as a cure for a horrible head cold. The texture is soothing and when no other flavor sounds good to my stuffed up head, this always hits the spot. YES you can make this with vegetable stock instead of chicken, and YES if you ‘accidentally’ roast too many cloves of garlic you should throw them all in anyway. Go make a double batch, put some in the freezer, and enjoy the creations you will come up with. There is a blizzard heading into New England and this is my go-to soup every time it snows. Tonight I am pairing it with a bacon and spinach quiche. It is quick and easy to make – a real favorite! I’d never had garlic soup before, and I’m glad I chose your recipe! I found my garlic needed a lot more time than your guide, but soooo worth the wait! No way will I subscribe since the ads won’t even let me read the recipe much less the commentary. It just keeps shifting away and repeating the ad over and over and over even after clicking and bringing up the ad page separately … and I don’t even own a dog. Sorry about the ad trouble. It should be fixed now. I was on vacation and not paying as close attention as usual. Do let me know if it continues to be problematic on your end. For years this has been one of my favorite seasonal comfort foods. I like my soups a lot thicker so I cut way down on the broth – only adding enough to barely cover the garlic & onions. I find it doesn’t take quite as long to roast the garlic – maybe 35-40 minutes. I also use my immersion blender. It ends up being one main dish serving this way – talk about a garlic haze! Totally delicious & delightful. I’m wondering if you have the garlic amounts in ounces. With such an (admirably) large quantity of garlic, that would be helpful, since clove size varies so much. Thank you! This was DELICIOUS!! I could see it being a base for lots of additions too- potatoes, white beans, pasta, carrots, roasted broccoli or cauliflower, mushrooms….. I floated a few croutons on top- Simple, easy, delish. Thank you! We love this soup! I’ve only recently discovered it, but have already made it twice. It really showcases how different garlic can taste. The first time I made it with some garlic that had huge cloves (no idea what type of garlic it was – i just found it at the market) and they gave a delicious sweet taste. Made it again last night with ‘regular’ garlic and the garlic flavour was a lot more intense – not a bad thing in my book! Also added a couple of finely chopped potatoes to give it a bit more substance but the two of us finished it all in one sitting anyway. Nom! I love, love, love making your recipes. And this was was no exception. My three teenage boys loved it. Next time, I will double or triple this recipe. I have been following your blog for YEARS. And your cookbooks are two of my faves. Please…keep cooking. Made this a million times…. So good! Makes a great dip too! I love adding beer instead of cream with a splash of milk. Also rev up the herbs… Basil, dill, MORE thyme.. Etc. Was thinking of making a very large quantity for an event coming up… if you were going to add a protein to this, what would you suggest? I was thinking of doing a bacon brushcetta or crostini to dip into it…thoughts? Bacon sounds good. There’s a garlic/gruyere toast in this soup that’s nice too. Just don’t let your Dog or Cat get any. Garlic is so toxic to dogs and Cats it can kill then. However, for people it is a natural anti bacterial , fungal and even has anti inflamitory benefits! Thanks for the recipient , better than Chicken soup for a cold ! I’m trying this tonight (because I’m really sick) and I couldn’t decide between this and tomato soup. So I thought why not have both?! So I’m making this, but in the step where you’re sauteeing the onions, I’m adding some chopped fresh roma tomatoes. I’m going to let that slooooowly reduce down just with the onions to get everything caramelized, then proceed adding broth and everything as it says. I’ll let you know how it goes! I have a monstrous appetite for garlic, and I’ve been eyeing this recipe for years before making it today. It is STUNNINGLY delicious! I was so exited to finally be making it, though, that I made a mistake: after the second simmer, I whisked over half of the huge fluffy mound of pecorino I’d grated with a microplane directly into the soup before I realized that, per the recipe, it was supposed to be used for garnish. While I tasted it before adding the cheese and found it pretty perfect as is, the pecorino make it just that much more luxurious. Because the soup became a little salty, I thinned it out with about a cup of water. I also whisked in the juice of a quarter of a lemon to balance out the richness. I still might add some cheese the next time I make this (and there WILL be many, many next times), but not as much, because I think the pecorino competes a little too strongly with the pure garlic essence that I tasted before adding it. Perhaps parmesan wouldn’t be as assertive, and the next time I have it in the house, I’ll follow the recipe and use it instead. They took your recipe and photo, but didn’t bother to credit you. Ugh, thanks for letting me know. I am pondering making a chicken stock for this enticing garlic soup. Is it worth the time or am I ok taking a short cup with canned chicken broth? I think in a recipe with a shorter ingredient or a single-vegetable soup like this, a homemade stock can be really nice and really make a difference. But! There is so much flavor here, you might not catch the layer of depth that comes from homemade as much as you would with, say, this cauliflower soup. Btw, this is my go-to very simple chicken stock. This looks delicious! Any help on figuring out how many onions of what size I need for 2.25 cups sliced? I’m thinking 3 medium, but I’d appreciate any help. That would be my guess too. I’ll have a better measurement after the next time I make this.